First, install and activate the Corporate Pro child theme and all of the required plugins. If necessary, install and activate WooCommerce and Genesis Connect for WooCommerce. Delete any unwanted content from your site e.g. Posts, Pages, Menus, Widgets. 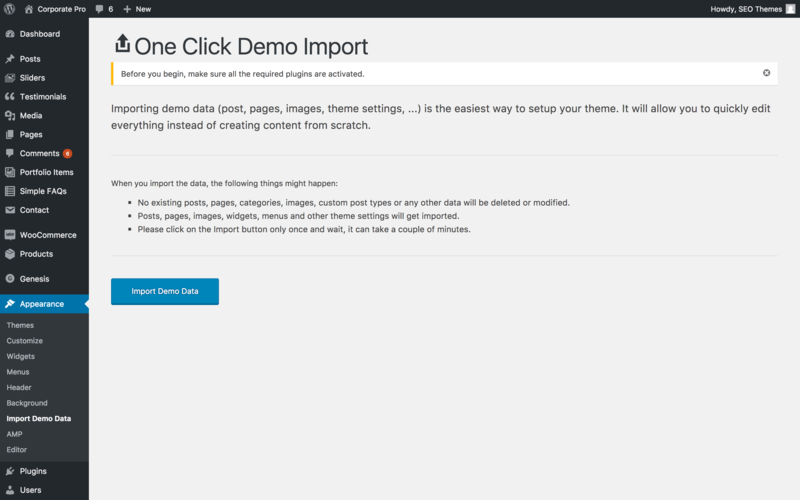 Navigate to Appearance → Import Demo Content page from your WordPress dashboard. Click on the Import Demo Data button. Please wait for few minutes and all the demo content will be imported (can take up to 5 minutes depending on your internet speed). Once complete, make sure to save the permalinks from Settings → Permalinks menu. Navigate to the front end of your website to make sure everything has been imported correctly.